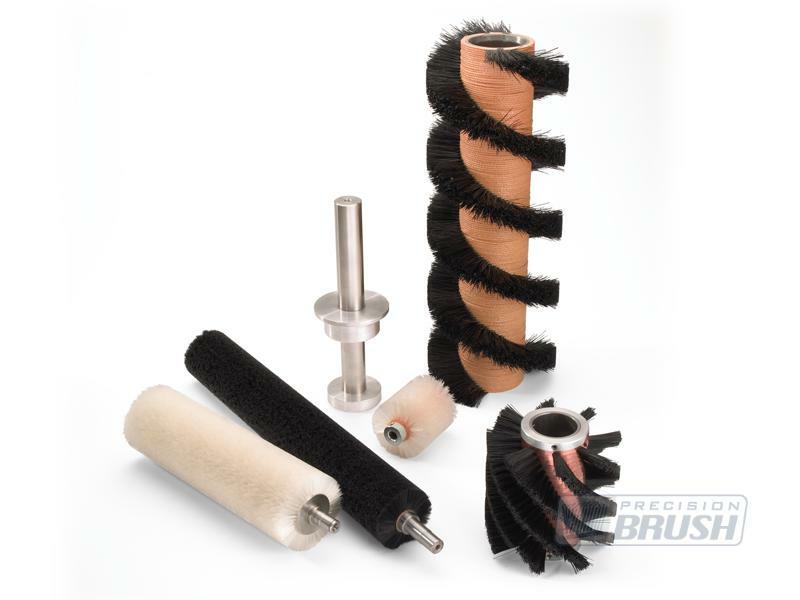 Precision Brush Company offers epoxy wound cylinder brushes which are manufactured by feeding filament between epoxy-coated strings. This unique brush design enables filaments to be uniformly distributed across the brush surface to provide consistent filament contact. By adjusting our filament feeding mechanism, we can also manufacture tufted cylinder brushes enabling us to create unique designs and patterns such as open spiral designs and herringbone patterns. 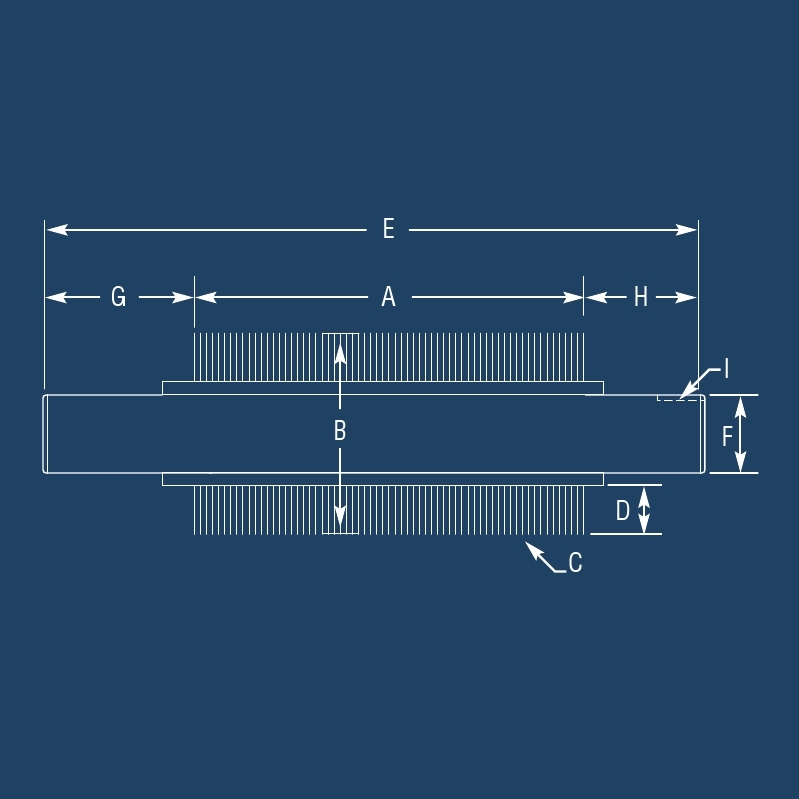 Epoxy wound cylinder brushes can be balanced to a specific RPM. 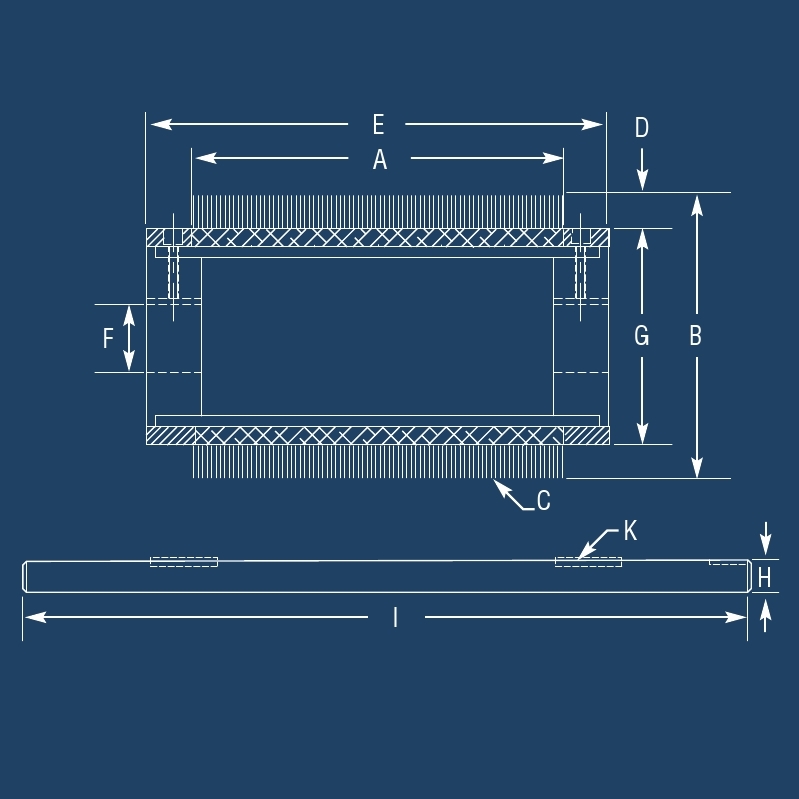 The Integral Core Design is a complete brush and core assembly manufactured with a shaft. The shafting can be customized to accept your bearings, drives, locking nuts, etc. 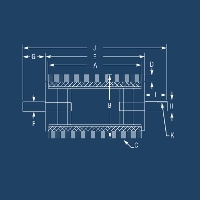 It is the best design for applications where TIR and balance are critical. Most integral cores are reusable and can be returned for re-bristling. The Solid Shaft Design can be created as a simple shaft with nothing more than a key to drive the brush. The shaft diameter determines the base core size and the filament projects from the entire distance from shaft to brush OD. The shaft ends can be customized to accept your bearings, drives, pulleys or various sprocket sizes. The Set Screw Arbor brush design and core assembly is manufactured with in-line arbor bore holes to fit on a customer’s thru shaft. The brush and core unit are mounted and secured on a keyed shaft. This design is available as a light-duty brush with aluminum heads typical of disposable brushes. For more aggressive applications and high speeds, our tapered locking collar design provides better holding power, concentricity and balance. The above described brushes are the most common types of epoxy wound cylinder brushes; however we are able to customize the brush cores to your desired design. Below are descriptions of other unique designs that are available. The Permanent Arbor Assembly Design has a custom shaft and a separate brush sleeve with internal sleeve compression fittings (taper lock bushings). 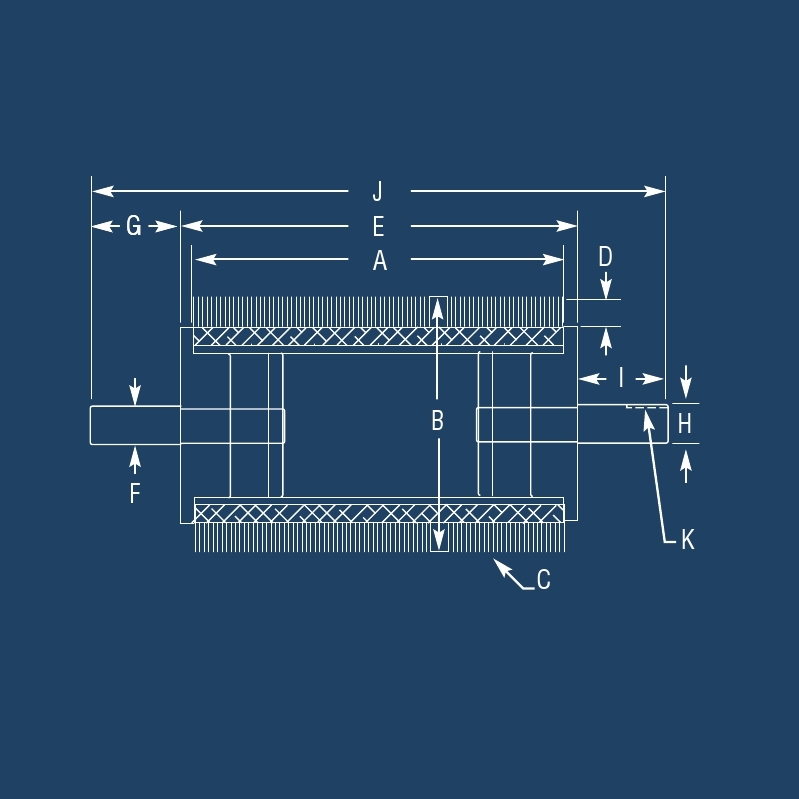 Simple assemblies include flanges to fit the brush sleeve that are driven with an internal key, drive pins, or sometimes a compression nut on one side. More aggressive applications require large rigid shafting, more substantial sleeves and close operational tolerances. This brush style is designed to be either re-bristled or thrown away. The Adaptor Bushing Design is a disposable brush and core sleeve supplied with adaptor bushings to fit your specific shaft size. This style brush is usually compression driven and the adaptor bushings can be reused. The Internal Bearing Design and core assembly is designed to accept internal hubs, which could include a V-belt hub for driving the brush or internal bearings. The Disposable Sleeve Locking Collar Design slides directly on a shaft and is secured using locking collars with set screws. These disposable brush sleeves are throw-away brushes, intended for shaft diameters up to 1-3/4”. The Disposable Sleeve Compression Design and core assembly slides directly on a shaft and is secured using compression. 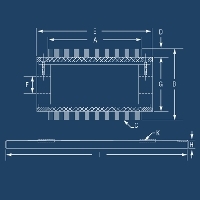 These are disposable brush sleeves intended for shaft diameters up to 1-3/4”.